The following projects were selected to realise a step change in system-level composition for robotics, and will demonstrate this in real-world scenarios. The step change will not only be visible in the modelling foundation of the contributions, but also in the industry-grade quality of their realisation. In the medium-term future, companies should be able to rely on the RobMoSys outcomes to build robotic applications by composing high quality composable models and associated software functions. In our first open call, we asked for projects to illustrate their contribution in the domain of robot-centric motion, navigation and manipulation. Extension of Behavioral Trees model for robotic application and integration in RobMoSys for behavior definition. 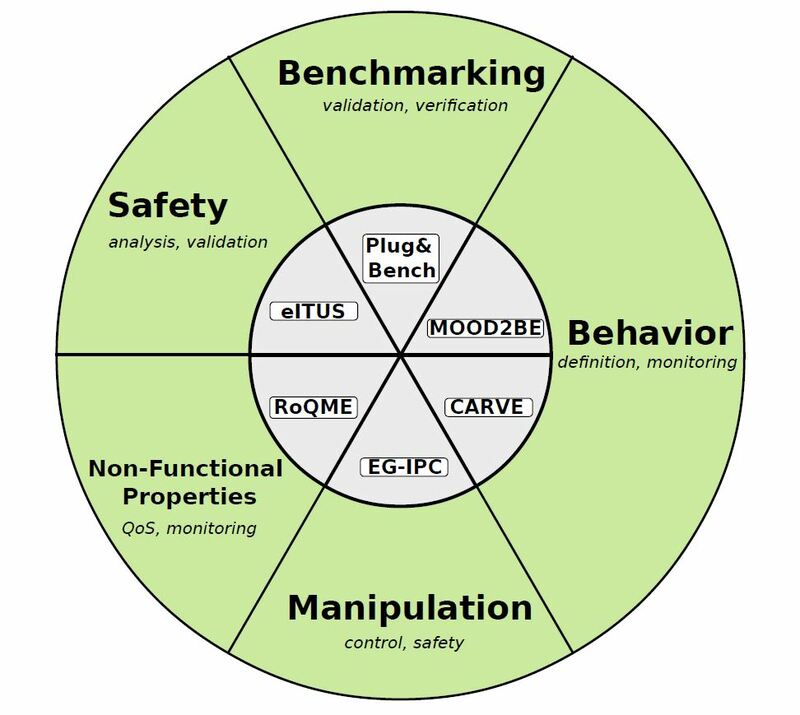 Development of formal verification tools to assess correctness of defined behaviors (the approach involves compiling BTs into DFSMs RobMoSys models). Development of monitoring models to assess correctness at runtime. Integration of YARP in RobMosys at a conceptual/formal level and at implementation level (SmartSoft). Demonstration of the approach in real world scenarios. Dissemination activities (eg. hands-on sessions at the Winter School on Humanoid Robot Programming). Creation of a behavior market which complements the component market in RobMoSys. Giving access to RobMoSys to the iCub community by making the architecture YARP/iCub compatible. Promoting RobMoSys in the iCub community through dissemination activities. IIT: Lorenzo Natale, Michele Colledanchise. University of Genova: Armando Tacchela. UTRC-ALES: Alberto Ferrari, Valerio Senni. To extend IPC to deal with the loss of stability due to delays in computation and networks when implementing the controller (EG-IPC). Implementation of metamodels for EG-IPC (compliant with the existing Communication Pattern metamodel in RobMoSys). Demonstration of benefits of the approach in a telerobotics experiment with communication QoS as variable. The project will include EG-IPC into the RobMoSys ecosystem. Since EG-IPC (when applicable) leads to intrinsically safe and stable operating system, the expected impact is high. University of Twente: Jan Broenink, Douwe Dresscher. TNO: B.N. Krom, Oliveira Filho J.A., B.J.F. Driessen. integrate existing safety validation tools (FTA, FMEA) with RobMoSys tools. develop and integrate new validation tools (simulation based FI). perform benchmarking of the tool infrastructure using an industrial case in laboratory. Potentially large user base: assessing safety is a major concern, the approach builds on standard and accepted technologies (eg. Gazebo, Ros). It will contribute with an useful extension to RobMoSys. The significant effort allocated for dissemination will help to reach out for potential users. Integrate an existing and tested BT implementation in the RobMoSys ecosystem based on the existing RobMoSys meta-models. Validation of the approach in real world experiments. High impact expected as behavior specification is a major concern in model-based robotic system development. The fact that they plan to work within the existing RobMoSys metamodels instead of adapting their own should increase the acceptance of the solution in the RobMoSys community. The use of a 100% open source strategy is further beneficial to the impact. Definition of a Benchmark Meta-Model for systematically benchmarking components. The Proposal builds on top of the output of several benchmark related EU projects in which the partners were involved. Different possible solutions to composability of benchmarks are defined in the proposal and are planed to be explored. 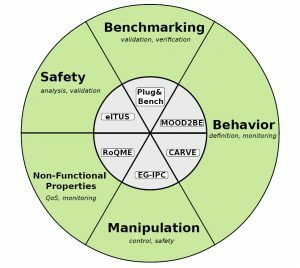 Development of a Benchmark Engineering tool. The importance of benchmarking in robotics is being increasingly recognized, so the impact of this addition to RobMoSys will be high. The introduction of benchmarking will also result in the potential introduction of the new role of the Benchmark Provider. Framework for defining non-functional properties in terms of quantitative contextual variables + metrics (QoS). Definition of new: role (QoS engineer) and view (QoS view). Definition of Meta-models to implement the framework. Contribution to several RobMoSys user stories: Quality Of Service, Management of Non-Functional properties, safety. The proposed technologies have a potentially large user base: Semi-automatic monitoring and inspection, framework to enable quality of service parameters.